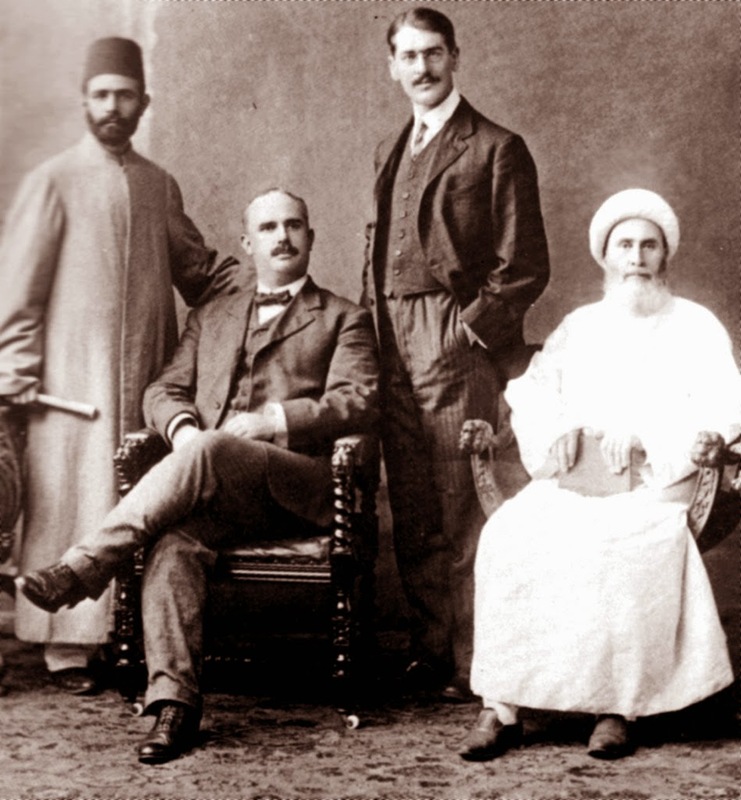 "The revelation of the Tablets of the Divine Plan, during the somber days of that tragic conflict, had, in the concluding years of 'Abdu'l-Bahá's ministry, invested the members of the leading Bahá'í community in the West -- the champions of a future Administrative Order -- with a world mission which, in the concluding years of the first Bahá'í century, was to shed deathless glory upon the Faith and its administrative institutions." These Tablets were sent to the believers in North America twice. 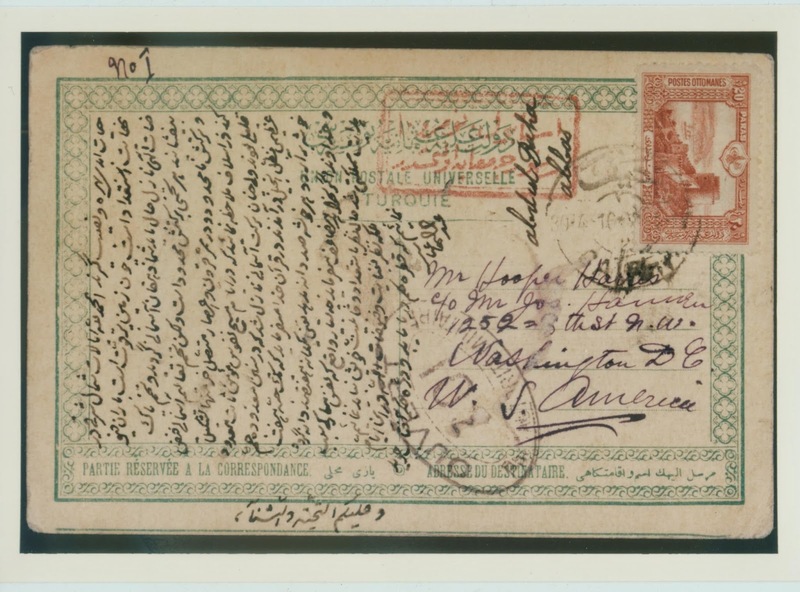 First, in 1916, they were sent by postcard, in Persian and Arabic with English translation, to the address of Joseph Hannen, a prominent early believer. Not all of them reached their destination. 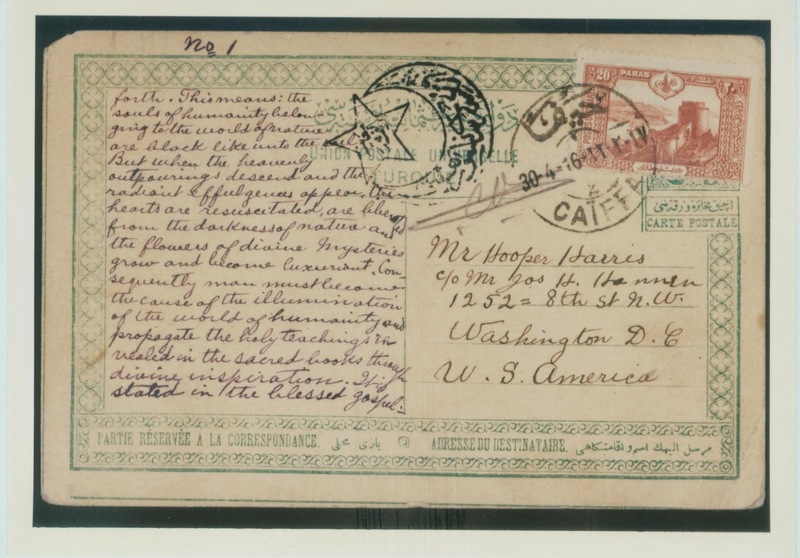 This was during the days of World War I and the postcards bear the Crescent and Star seal of the Ottoman censor. 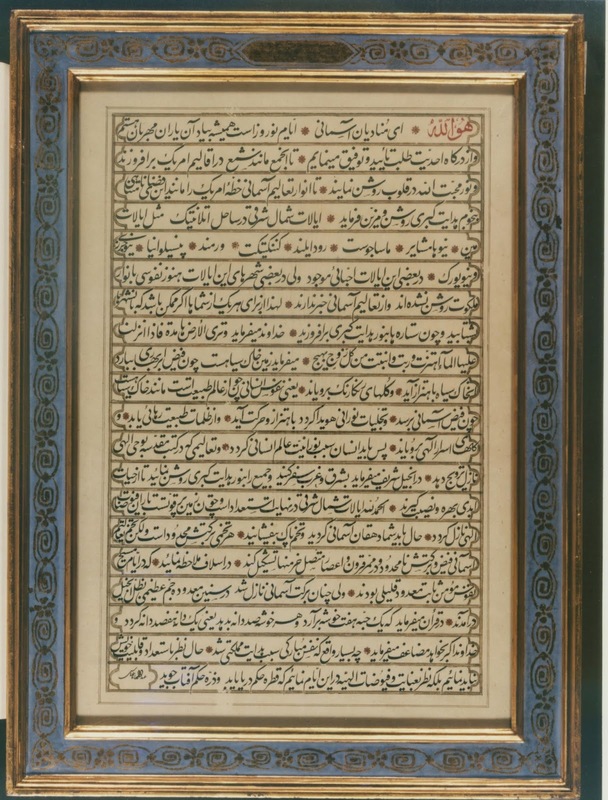 Tablet of the Divine Plan to the Northeastern States in calligraphy by Nuri'd-Din, bearing the original signature of Abdu'l-Baha at the bottom left. After the war, in 1919 the same Tablet, in exquisite calligraphy, was brought to the United States. 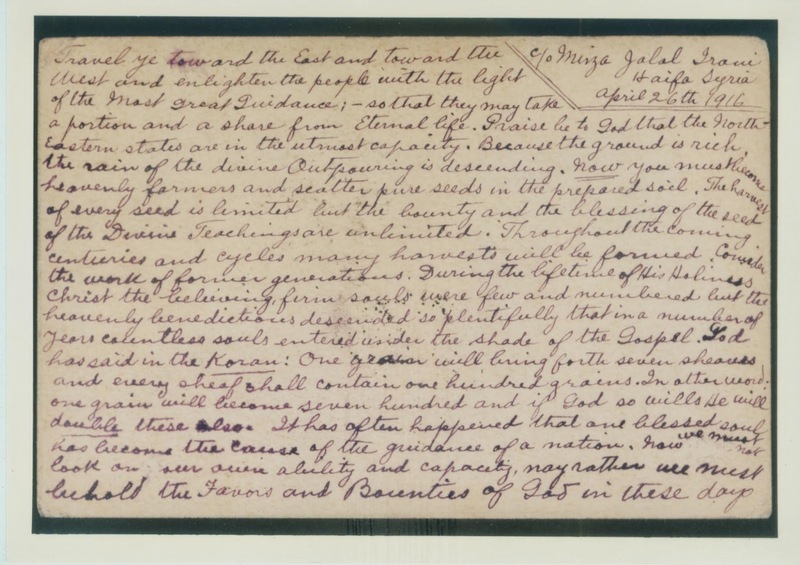 These images were obtained from the U.S. National Baha'i Archives. The Archivist said that the National Spiritual Assembly has stated that they can be shared freely with the friends. If you copy these images and share them with others, please include the photo credit: "Courtesy, Baha'i National Archives, Wilmette." Please click on the images for larger photographs. 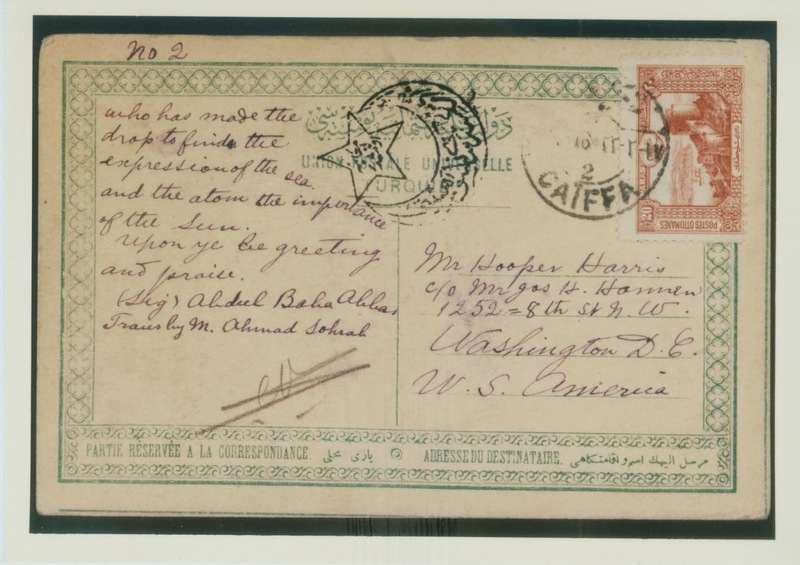 Please see this posting for further details about Abdu'l-Baha's signatures on the postcards and on the calligraphy, the seals on the postcards, and the return address in Haifa. 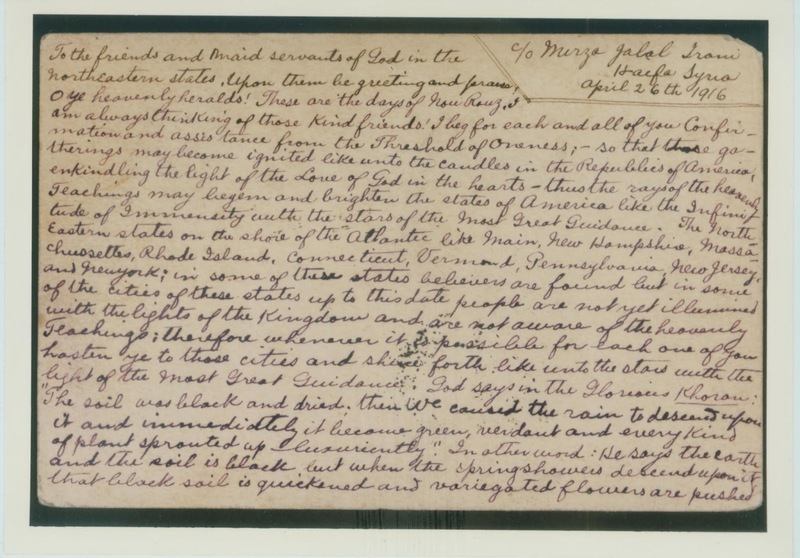 "In 1919, at the Annual Bahá'í Convention in New York, the Tablets revealed by 'Abdu'l-Bahá at a time when He was in great danger during the First World War and which have come to be known as the "Vehicles of the Divine Plan" and the "Spiritual Mandate," conferred by Him on the North American Community of Believers, were unveiled. We American Bahá'ís are all familiar with their remarkable and stirring contents. We were all immensely proud to receive them. No one, however, except Martha Root and a few other venturesome souls, felt moved to do anything drastic about carrying out the instructions contained in them prior to 1936-37. It was then that Shoghi Effendi's teaching, inspiration and advice began to pour into the minds and hearts of the American Bahá'ís like an incoming tide. He called us to action. For eighteen years, we had basked happily and complacently in the praises and promises 'Abdu'l-Bahá had showered upon us in those Tablets, and in many other writings and statements. The Guardian, however, his fingers on our pulse, knew that we were now able to arise for pioneer work, and through the instruments of the Administration he had so carefully assisted us in evolving, carry forward the frontiers of our achievements. He was, thank God, not mistaken in the confidence and trust he reposed in us. He called and America responded. People from every walk of life, business men, stenographers, old ladies, young ladies, people with families, people often frail in health but iron in spirit, began to arise, and what may in future well be viewed as one of the greatest spiritual sagas of the American nation, began to take place. They were called pioneers, and into new cities, into the virgin States of the United States and the virgin Provinces of Canada-virgin as yet to Bahá'u'lláh's light-these people began to move, at the cost of great personal sacrifice and inconvenience, inspired by nothing but faith and devotion and love for their fellow men, they started to lay the foundations for new Bahá'í communities by establishing new Spiritual Assemblies as a result of their teaching activities." We are indebted to Mr. Harris, who had the privilege of taking the notes of the first address of Abdu'l-Baha in the United States, given on the very day of His arrival in America, April 11, 1912, and recorded in The Promulgation of Universal Peace. Mr. Harris also took the notes at one of the last addresses given by Abdu'l-Baha, a very unique and interesting address given in the home of Juliet Thompson. 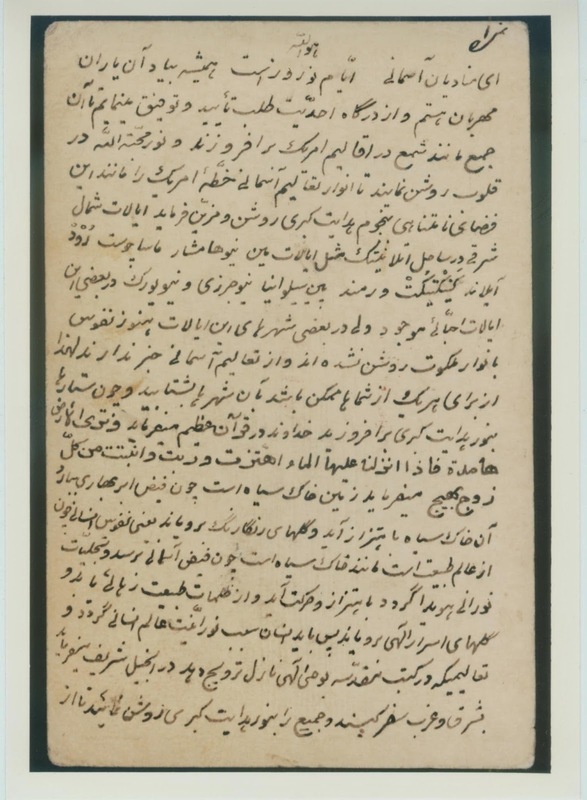 According to Mirza Mahmud, the Master also visited Mr. Harris' home and spoke there. Mr. Harris is quoted by William Sears in Thief in the Night in the course of his explanation of Daniel's prophecies.